Thank you to Terry Sudman McDonald for sharing this video with us. If anyone has any information on this video, for example the purpose or the year it was made, please email knocca@wapak.org. 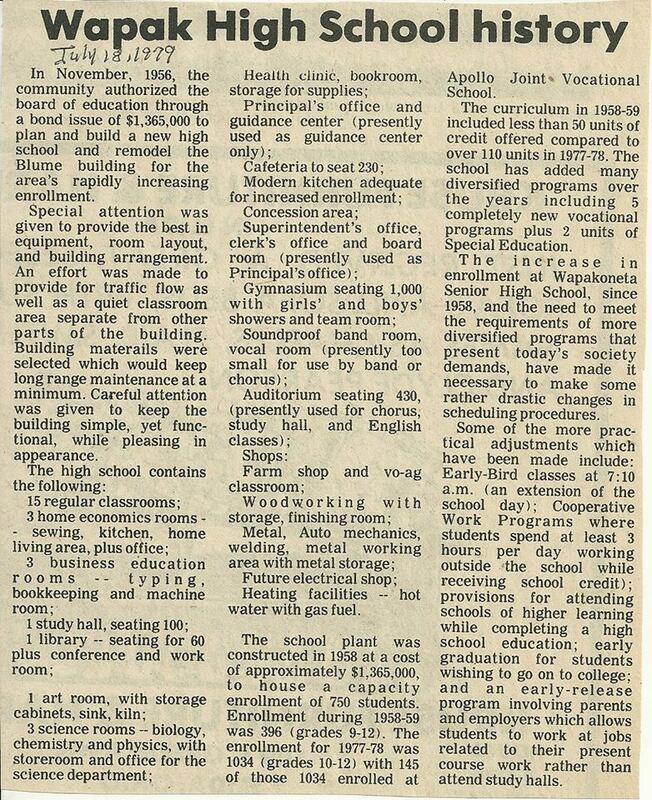 At the time of this article Wapakoneta High School was the location of our current Middle School building. Wapakoneta City Schools encompasses the communities of Buckland, Cridersville, Freyburg, St. Johns, Uniopolis, and Wapakoneta. Founded in 1872, Buckland was originally named Whitefeather. The present name, adopted in 1891, is for a man named Buckland who was credited with bringing the railroad to the site. The population was 233 at the 2010 census. Cridersville: Ephram Crider is credited as being the founding father of Cridersville in 1856. The population was 1,852 at the 2010 census. Freyburg, an unincorporated community, was laid out in 1848 at the site of a former Native American settlement. Saint Johns was founded in 1835, and named for John Rogers, proprietor. In the center of Saint Johns, on the corner of Center Street and Walnut Street, is a memorial recognizing this place to be known as Chief Black Hoof's last home. As of the 2010 census it had a population of 185. Uniopolis was founded in 1837. It is now an unicorporated community and former village with a population of 222 at the time of the 2010 census. Founded in 1782, Wapakoneta, pronounced Waw-paw-ko-net-a, was originally an important location to Native American tribes of the Ottawa and Shawnee. Wapakoneta is the county seat to Auglaize County and recorded a population of 9,867 at the 2010 census.